Most legends grow to become something beyond their actual size. That never seemed to be true of Bill Fralic, the former University of Pittsburgh and Atlanta Falcons offensive lineman, who died Thursday at the age of 56. He was as big as he was often described to be, and if you’re a certain age and you grew up in Pittsburgh, that was always enough to make him seem bigger than life. Fralic’s father, Bill Sr., was a steelworker (naturally). When Fralic was 11, Bill Sr. took him to meet the coach of a powerhouse Pittsburgh youth program, to inquire about signing up. Players had to be 13 to 15, Bill Sr. was told. “Wanna look at him?” he asked the coach. The coach looked. “We just changed the rule,” the coach replied. In the seventh grade, Fralic was already 6-foot-1, 210 pounds. By the summer before he started ninth grade, he was 6-foot-3½, 235. At that time, Fralic was working at a Western Pennsylvania golf course, where he met then-Pitt head coach Jackie Sherrill. “What college do you play for?” Sherrill asked him, only to be floored to discover Fralic hadn’t yet begun high school. Obviously, both of these stories could have been exaggerated for effect. But the fact that they have more than a veneer of plausibility—the Sherrill anecdote was the lede to the Pittsburgh Post-Gazette’s obit on Fralic—is the real giveaway. Fralic was a prodigy. He also lived up to the hype. In 1980, at Penn Hills High, in the near-eastern suburbs, he was Parade magazine’s lineman of the year. He was also the national male high school athlete of the year, a distinction that had gone the year before to Herschel Walker. 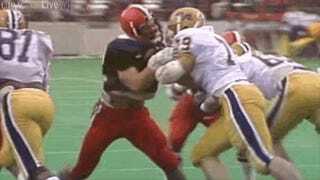 Fralic chose to stay home to play for Pitt, which in those days was a national power quarterbacked by Dan Marino. Fralic by then was 6-foot-5, 265, and he became the first Pitt player to start the first game of his true freshman season since Tony Dorsett in 1973. The Panthers would rise to No. 1 in the country during Fralic’s freshman and sophomore seasons. 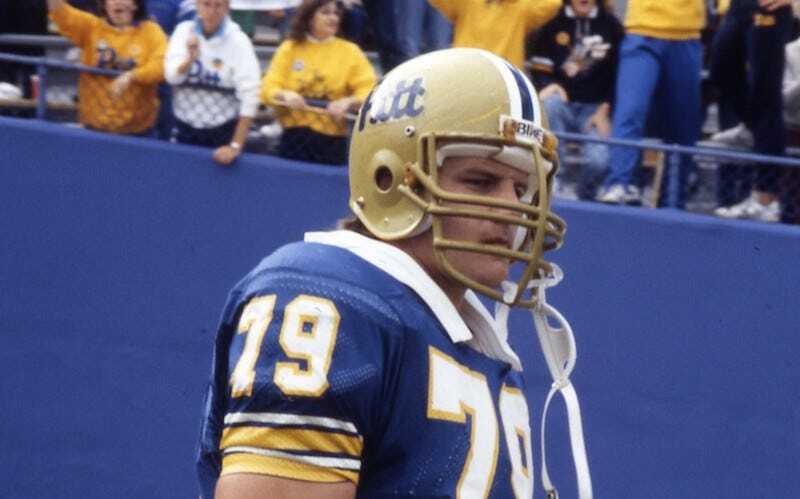 From the moment he arrived at Pitt, Fralic played with a controlled ferocity and worked out with abandon; his former high school coach, whom Sherrill had hired as an assistant, told UPI a tale about how Fralic once called him at 11 p.m. on July 3 to get a key to the weight room. The coach told him the room was closed. At 8 a.m. the next day, Fralic showed up at the coach’s house to get the key. Linemen typically didn’t get much recognition in those days, but Fralic’s exploits were too obvious to ignore. I distinctly recall this shirtless photo of him that appeared in Sports Illustrated in September 1984. To 9-year-old me, Fralic looked like freakin’ Hercules. Played like him, too: He was a human pancake machine. The pancake block stat, in fact, was invented by Jim O’Brien, Pitt’s then-sports information director, as a way of quantifying Fralic’s dominance. Check out some quotes about Fralic from a 1984 story in the Oklahoman newspaper, in the run-up to an Oklahoma-Pitt game during Fralic’s senior year. Still, according to the Associated Press, the university went into damage control mode, and both the reporter and the editor of the student paper resigned. A little more than a month after that, per the AP, Fralic was cited for simple assault after a woman alleged he threw a glass at her at a local bar “for no apparent reason.” The woman, who received treatment at a local hospital for a forehead laceration, never pressed charges. She did tell a newspaper she had received an out-of-court settlement, only to reverse course a day later to deny there was any settlement, while also declining to say whether the incident even took place. The Falcons drafted Fralic No. 2 overall in 1985. In eight seasons in Atlanta, where he played right guard, Fralic made four Pro Bowls and was a two-time All-Pro. The NFL selected him to its all-decade team for the 1980s, and he finished his playing career in 1993 with the Detroit Lions. 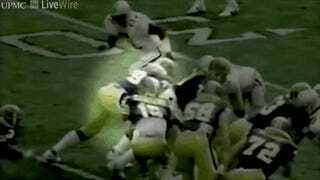 In 1990, Fralic revealed to Sports Illustrated’s Peter King that he had used steroids while at Pitt. After his father once found his stash of Dianabol, Fralic told King, he explained himself by saying, “Everybody else is doing them. If I want to be a player, I’ve got to do them.” During his NFL days, Fralic became an outspoken opponent of performance enhancing drugs, at one point testifying before the Senate Judiciary Committee that “probably about 75 percent” all NFL linemen, linebackers, and tight ends were on the stuff. This stance put him at odds with some of the leadership at NFLPA and several of his fellow players, who resisted Fralic’s call for a frequent random testing regimen—a tactic that tends to shift more of the risk toward players and to absolve management of perhaps pressuring players into seeking an edge. Fralic ran an Atlanta-based insurance company after his playing days, and he did separate stints as a radio color commentator for Pitt and the Falcons over the years. His name was recently in the news again. Last Friday, when Penn Hills High played for (and won) a Pennsylvania state football championship, budget constraints forced the team to plan to drive to Hershey, Pa., to play the game, and to travel back, all in one day—a 420-mile round trip. Bill Fralic stepped in to cover the team’s hotel costs so it could get there a day early. His legend somehow got even bigger.